When I wrote my humble tribute to the late Marcella Hazan a few weeks ago, I started to think about the women who have inspired my love of cooking. Naturally, my mother and two grandmothers are at the top of the list despite my early rebukes of their efforts. Another special woman who kept coming to mind is my good friend Lida, the chef and co-owner of Agriturismo La Pagliarella in Sant’Elia, a frazione – hamlet – of the town of Caramanico Terme in Abruzzo. 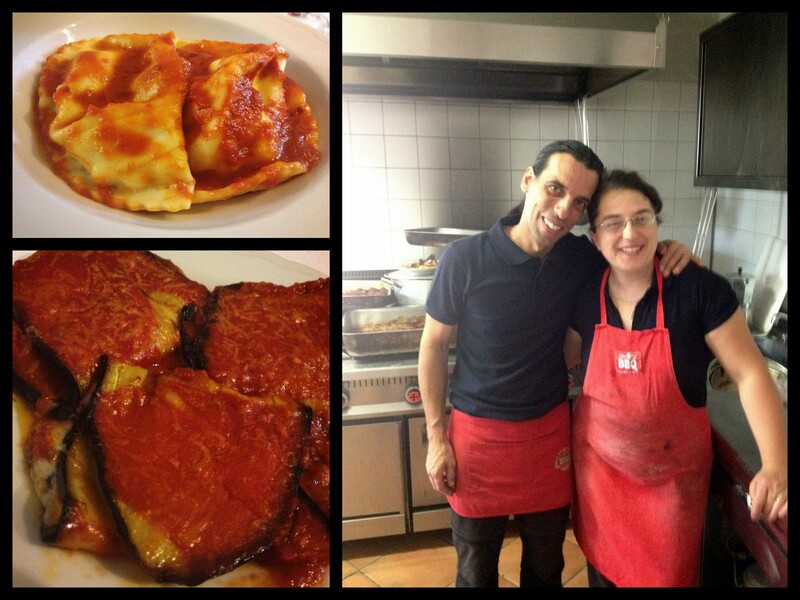 My family discovered La Pagliarella about five years ago during a dinner with a large group of relatives and friends. Although I spent most of the evening chasing after my toddler, I recall the entire table sighing with satisfaction as they proclaimed Lida’s ravioli the best they had ever eaten (high praise considering the culinary prowess of some of the mothers of those diners, my grandmother included). 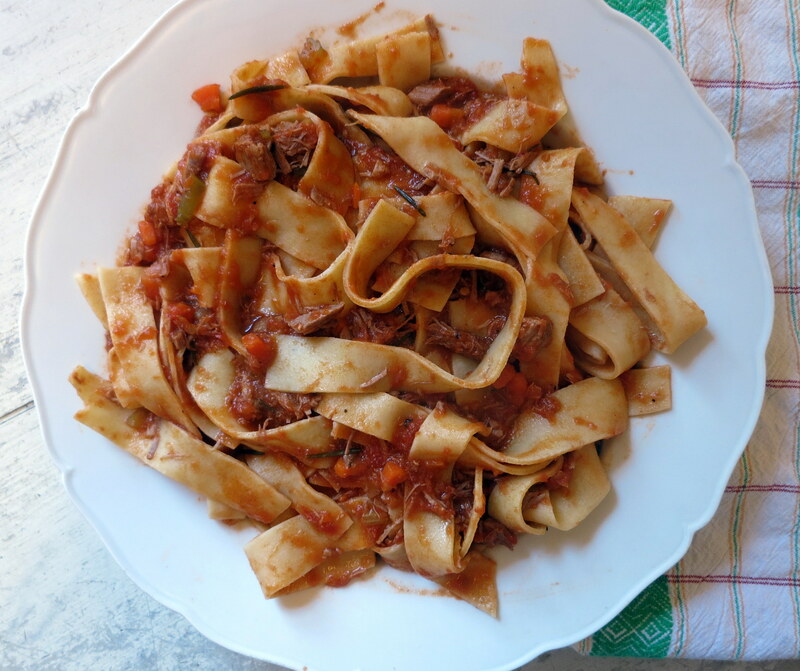 Although not classically trained, Lida is an immensely talented cook who tackled her family’s arsenal of traditional Abruzzese recipes and refined them to her tastes. 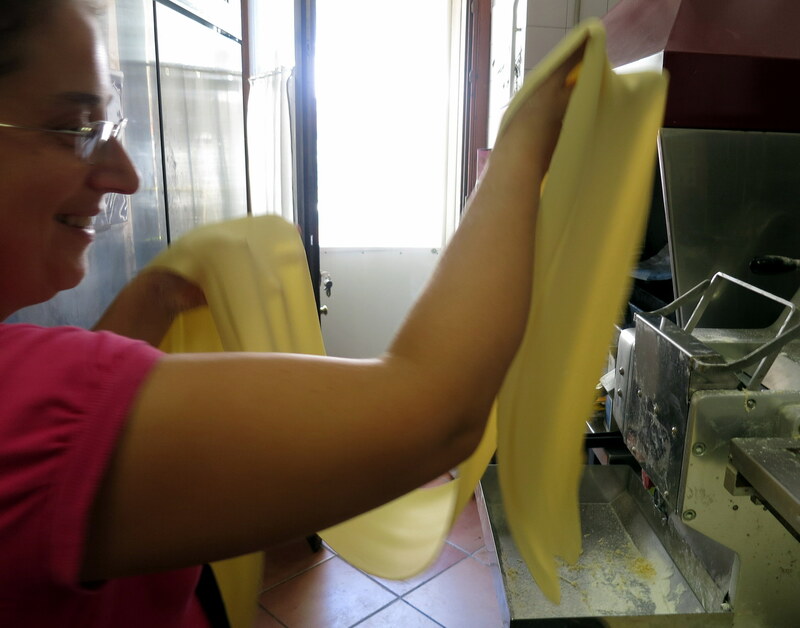 She is a master with pasta – the texture is delicate but has a slight rusticity that is characteristic of fresh pasta in Abruzzo. She also makes the best zuppa di farro I’ve ever tasted and prepares an eggplant involtino that has invoked a collective sigh from a table of 30 unreasonably discerning diners. And let’s not even get started on her pallotte cac’e ove (my recipe is adapted from hers) and homemade cheeses. Over the years, Lida, her husband, Andrea, who runs the front of the house, and their three lovely children have become cherished friends. When I started catering, Lida graciously invited me into her kitchen for some mini cooking lessons. 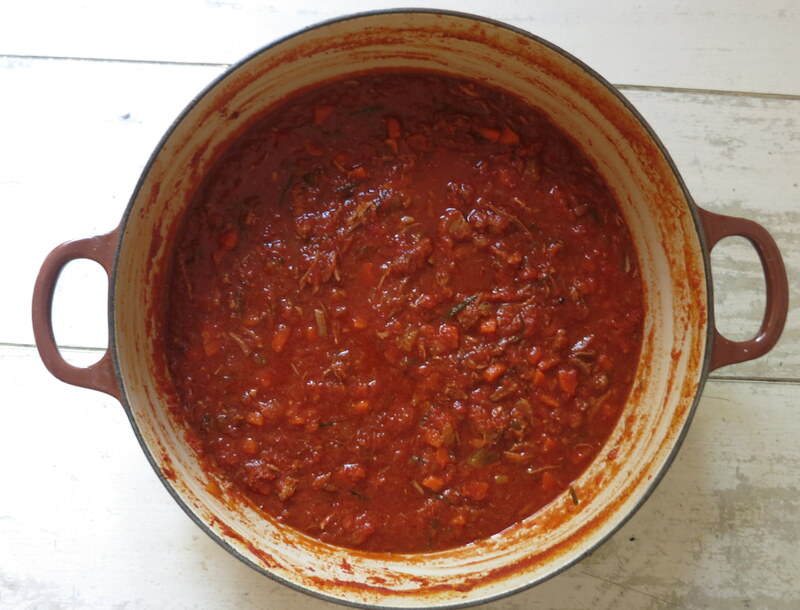 This past August, we stopped in for an impromptu farewell lunch a few days before heading home to New York and I found her putting the finishing touches on sugo di cinghiale – slow-cooked sauce of wild boar. The day before, a hunter had surreptitiously knocked on her backdoor with some local game. She waved me into the kitchen and explained her method of braising the meat which she served with her perfect homemade pappardelle. The sauce was full of flavor and heart. I have eaten cinghiale at other restaurants in Abruzzo and the meat, which is very lean, is often disappointingly tough. However, Lida’s low and slow method of braising rendered the meat perfectly tender. Last week, with Lida already on my mind, I randomly received an email from specialty food purveyor, D’Artagnan, featuring wild game and ordered a shoulder of wild boar from Texas. This is the first time I’ve ever cooked cinghiale as well as the first time I’ve ever eaten it outside of Italy. Although I consulted with other recipes, I ultimately decided to stay true to Lida’s simple, straightforward approach and am so glad I did – give it a try, you’ll be glad too. Wild boar has a reddish color and a more intense flavor than pork. Commonly found in the rocky mountains of Abruzzo as well as other parts of central Italy, here in the US, you can order humanely trapped, Texas wild boar from D’Artagnan. To a large Dutch oven or other heavy-bottomed pot, add the meat, ¼ cup of olive oil, onion, carrots, celery, rosemary, several grindings of fresh ground pepper, white wine and chicken stock. The meat should be completely immersed in the braising liquid; if it isn’t, add additional stock or water. Bring to a boil and then lower the heat so that the liquid is only gently bubbling (Lida calls it “fuoco dolce” – over a sweet flame). Simmer for 30 minutes with the lid slightly askew. Next, add the tomatoes, tomato paste and a tablespoon of salt, return to a boil, and then lower the heat as you did before so that the liquid is bubbling very gently. Cover, checking occasionally to make sure the sauce is not cooking too rapidly, and simmer for 90 minutes. After 90 minutes, uncover, adjust the seasonings to taste, add the remaining ¼ cup of olive oil and continue to simmer uncovered in the same low and slow manner for 90 minutes or longer. Turn off the heat when the meat is quite tender and the sauce has reached a depth of color and flavor with which you’re satisfied. To serve: Gently break apart the larger chunks of meat and serve over pappardelle or another thick, hearty cut of pasta. Serve with grated Pecorino and the slightest drizzle of good olive oil. Buon appetito! Ciao! That looks divine and takes me back to the Summer when I ate this for the first time. It melts in the mouth doesn’t it. Caramanico is beautiful isn’t it. Thanks, Louisa. It was fun recreating a dish that I truly associate with my time in Abruzzo. I absolutely love Caramanico. My dad’s village is just across the gorge. I’ve been feeling “homesick” lately! There are many wonderful women like Lida all over Abruzzo, which is why our region has some of Italy’s best cooking (IMHO). They are preserving tradition and at the same time moving the food scene forward with their agriturismi. Thanks for sharing Lida’s story. I’ll have to put La Pagliarella on my list of places to visit. How was the flavor of the wild boar? I’ve seen it for sale in high-end grocery stores and gourmet markets around here. I’ve always wondered whether it really is “wild” or rather farmed. At any rate, D’Artagnan is known for its quality so I’m assuming it was good? I agree wholeheartedly, Domenica. Women such as Lida are the custodians of culture, tradition and gastronomy. It is truly a gift to be welcomed into their kitchens. The wild boar from D’Artagnan was very good – fresh and lean. The website claims that it is truly wild and trapped humanely. The flavor was a slightly more intense pork flavor but not gamey. However, I think that might true of wild boar on general. Even the cinghiale I’ve had in Abruzzo and Tuscany was rather mild on flavor. I paired it with homemade pappardelle and used 1/3 semolina in the dough for a more rustic texture. Michelle – I’m so glad to hear that D’Artagnan sells good wild boar. I’ve eaten it many times in Italy, including freshly hunted by some cousins, but never expected to be able to find it here. Your story of Lida sounds so evocative of the friendly and welcoming spirit of Abruzzese people. How wonderful for you that she received you with open arms and showed you a few of her culinary tricks.